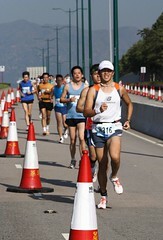 Completed AAC Hong Kong 2007 yesterday with Tempo Sparks teamate Andy. 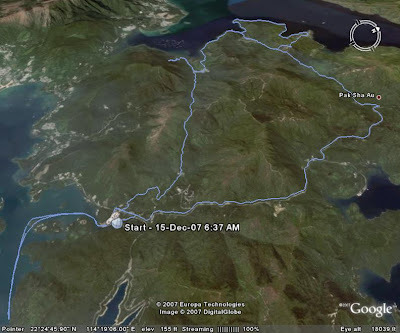 Photos & write up will come soon, first take a look at the race route to put things in persepective. On the penultimate weekend to Action Asia Challange, I paired up with Alain, my running pal in the SCB team to do the Action Asia Eco Adventure. It was such an interesting course, covering ground in a familiar area but trails that I never knew they existed. We started in Ocean Park, where the Shark and Flower mascots should lead the way with gentle stroll through the Panda habitat. But it seems all patience was lost after going through 5 speeches before the whistle was reluctantly blown, the Shark and the Flower sprinted faster than any of the runners and the race got underway. We had to coastalteer the boulders toward DeepWater Bay, before walking up a tunnel which is the mouth of a river. Then up some brush wracking trails, through some pitch black tunnels, before going up a stairways from hell to the top of Nicolas Hills. Then down a even steeper trail so slippery as if filled with ball bearings. On the way down we caught Alan and Arthur form Sonics, the former was nursing a bad wrist and elbow from the MTB on the previous day and the latter a bad knee after Macau Half Marathon the previous week, hence taking their downhill carefully. "Bad for them, Good for us." said Alain crudely, who was eager to beat anyone in our age group. 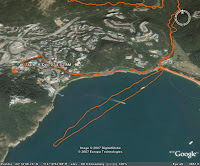 Back to Deep Water Bay via the mouth of the river again, came the 2km kayak. We cruised down and caught 1-2 boat, on the return leg, we again caugh sight of Alan and Arthur and Alain did another trademark assault, "Come On, my grandma can go faster than that!" I started legging my kayak as I know they were not going to take the abuse lightly, an could just imagine Arthur snapping the paddle in two and start outrigging the kayak. The kayak route above was based on Alan's GPS watch marking, look how furiously straight they have paddled after Alain's abuse. 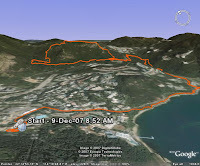 Finally, an easy jog around the coastal walk to Repulse Bay. We finished 2hr23mins with Alan & Arthur finished just 4-5 mins behind. 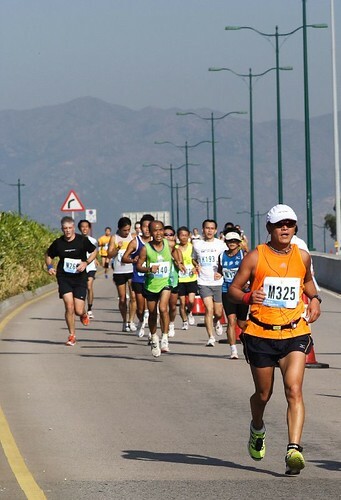 Coming Next Week, the Action Asia Challange Hong Kong 2007!!! The mother of all races. 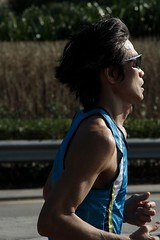 Week 2 was the UNICEF Run for Children Half Marathon. It was another great route, start and finish in the Disneyland Resort, the run takes in the coast line of Sunny Bay and the Inspiration Lake. 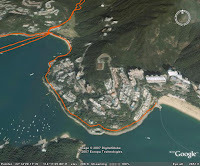 The area could be turn into the venue of the next ITU Hong Kong Triathlon is negotiation can be successful. I started off well, reaching the 10km mark at 50mins. 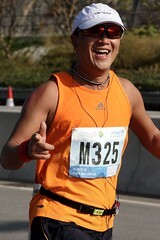 But soon hit the wall at 15km and finished with a disappointing 1hr55m, the slowest half marathon I have done. The event was more successful with Martina, who is becoming a great action sports photographer! Here are something to add to her portfolio.